Welcome to Implausible Nature! This website contains a compilation of Black Templars information including tactics, competitive army lists, battle reports, painting, and miniature gallery. However, the main purpose of this site is to teach new and veteran players how to use the Black Templars in the most competitive fashion. So if you're looking for help with the BT, then this is the site for you. 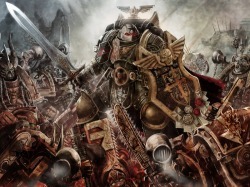 Check out Laeroth's Blog, where Schlitzaf and I make regular posts with all sorts of Black Templars and Warhammer 40k information. Before you get too deep into the website, please check out my Site Primer to learn more about why this website exists and who I am as a player. Then you'll have a much better understanding of why I give the advice I do and what I'm all about. 3) Where do the Black Templars fit? This web site is completely unofficial and in no way endorsed by Games Workshop Limited. All associated marks, names, races, race insignia, characters, vehicles, locations, units, illustrations and images from the Warhammer 40,000 universe are either ®, TM and/or © Copyright Games Workshop Ltd 2000-2011, variably registered in the UK and other countries around the world. Used without permission. No challenge to their status intended. All Rights Reserved. Images used with permission from owner DarkKnightCuron (Credit also given to original artist slaine69). Last updated on December 19th, 2018. Site created on September 15th, 2009. Implausible Nature™ is published and maintained by Bob Manias (Marshal Laeroth).